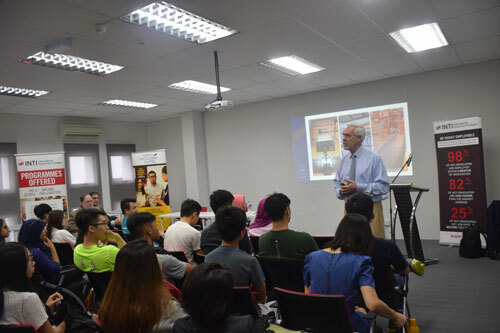 In light of the new partnership between INTI International University & Colleges and Southern New Hampshire University (SNHU) to launch its established 4+0 American degree programmes in Malaysia, Dr. Paul LeBlanc, President of SNHU recently visited the country to discuss “Innovation in Education for a Dynamic 21st Century”. Dr. Paul LeBlanc, President of Southern New Hampshire University (SNHU) addresses a room of SNHU and INTI students. As the President who spearheaded SNHU towards becoming the second largest non-profit provider of online higher education in the United States and #12 on Fast Company magazine’s “World’s Fifty Most Innovative Companies” list in 2012, Dr. LeBlanc also won the 2015 NH Entrepreneur of the Year Award, while Forbes Magazine listed him as one of its 15 “Classroom Revolutionaries” and “most influential people in higher education” for 2016. During his special address at the new INTI Subang South Block, Dr. LeBlanc compared the changes of the higher education industry to that of the music industry, highlighting the evolution from buying albums to the birth of Napster, to a new business model by iTunes, and now the ability to have more songs in a device than you do on your shelves. He then explained how the higher education industry is also relooking their business models and exploring new ways to serve students, with the rapid pace of technological change enabling innovation in teaching and learning. Dr. Paul LeBlanc takes a commemorative group photograph with the students that attended his “Innovation in Education for a Dynamic 21st Century” address. The most important characteristic of competency-based education is that it measures learning rather than time. Students’ progress by demonstrating their competence, which means they prove that they have mastered the knowledge and skills (called competencies) required for a particular course, regardless of how long it takes. He also noted that the biggest paradigm shift when heading towards competency-based learning is that students will be assessed on whether they have mastered the competencies rather than the time spent in the course. This major change is already well underway – as seen with SNHU’s College for America, the first university in the United States to be approved for federal financial aid under the U.S. Department of Education’s direct assessment provision. 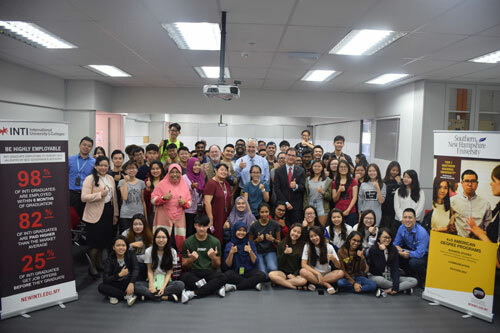 As SNHU’s partner university in Malaysia, INTI is offering three established 4+0 degree programmes in Business Studies, Psychology and Communication. A compulsory 15-week internship will also ensure students gain relevant working experiences even before they graduate. This is a testament to how INTI continues to elevate its commitment to develop the employability of its graduates – standing on records wherein 98% of INTI graduates are employed within six months of graduating, while 25% receive job offers even before they graduate. 82% are also paid higher than the market average, highlighting their edge over their peers. With these figures having been validated by BDO Governance Advisory, INTI remains the only institution of higher learning who can vouch for its employability outcomes.